On a recent Sunday, local musician Lash LaRue choked back tears as he told the story of the little girl who wrote him to say her new teddy bear took her nightmares away. Every year since 2003, Lash – real name Larry Dunn – has held a benefit toy drive for the children on South Dakota's Pine Ridge Indian Reservation, known as one of the poorest places in the U.S. Last week, he hand delivered about 1,000 toys at three Pine Ridge schools. The problems facing the reservation are many, and Dunn, who practices traditional Lakota spirituality, doesn't have an answer to them all. But he can put a smile on a kid's face, he said, and maybe that's a step in the right direction. The Pine Ridge Indian Reservation (Wazí Aháŋhaŋ Oyáŋke in Lakota ) is an Oglala Lakota Native American reservation located in the U.S. state of South Dakota. Originally included within the territory of the Great Sioux Reservation, Pine Ridge was established in 1889 in the southwest corner of South Dakota on the Nebraska border. Pine Ridge is the eighth-largest reservation in the United States and it is the poorest. Unemployment on the reservation hovers between 80% and 85%, and 49% of the population live below the federal poverty level. Many of the families have no electricity, telephone, running water, or sewage systems; and many use wood stoves to heat their homes, depleting limited wood resources. 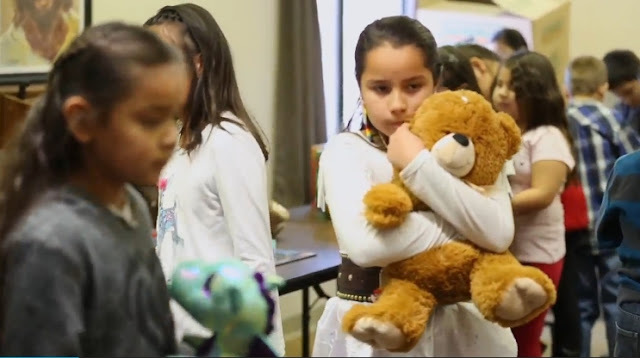 Responses to "Local musician delivers over 1,000 toys to Pine Ridge Indian Reservation "